If I lived downtown instead of in the suburbs, I would definitely take the subway to work. 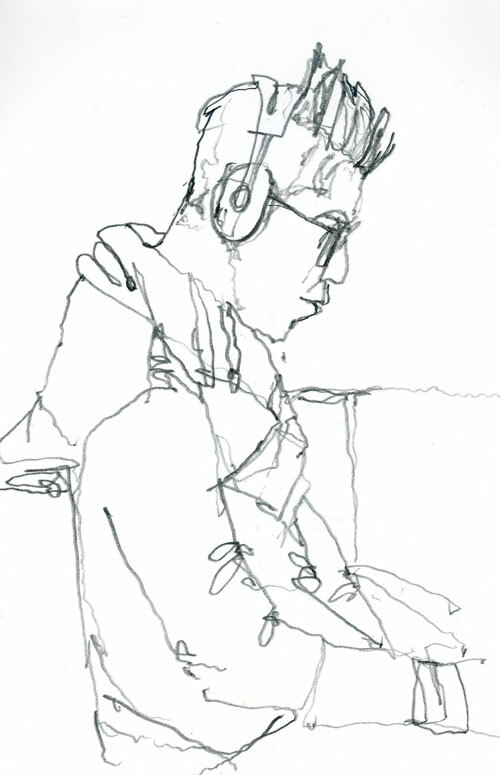 The Montreal metro is one of the best places to draw people. Unlike the bumpy bus ride, the subway ride is smooth enough to get some drawing done. Plus people usually stay still from stop to stop, allowing me to get some quick drawing done. And no matter what time of day, the ride (or the stale subway air) seems to lull them into a state of motionless oblivion. 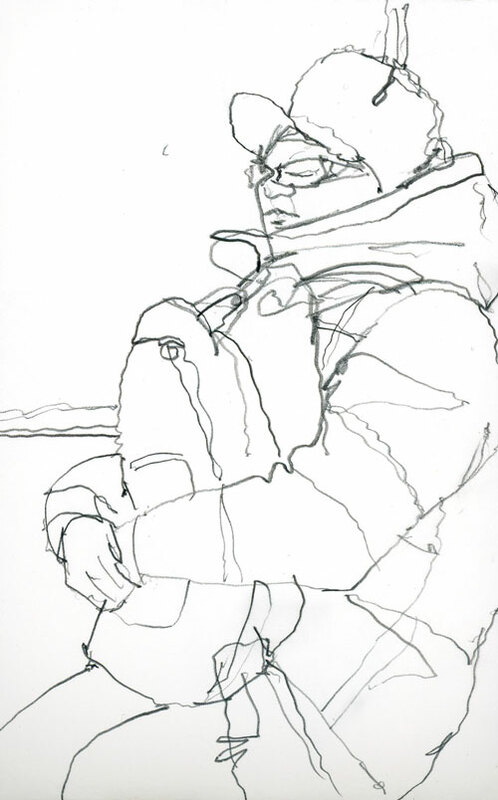 Sketched in a Stillman & Birn Zeta sketchbook, 3.5″ x 5″ (the book I always keep in my bag). What a week for painting trees. Even though they aren’t as orange as usual because of the warm autumn temperatures, they’ve been quite spectacular. On the day I went drawing with my students, we spent our last few hours painting a view of the McGill Campus from the stairs of the Redpath. This morning I sketched my favourite tree. This is the one I paint every autumn as the leaves turn yellow. It’s a stunner of a maple — perfectly domed, symmetrical and untouched by tree trimmers — but I can never seem to fit it all on the page of my sketchbook. If you look at last year’s post you can also find links to the four previous years. If you are in the Montreal area on Sunday afternoon, drop by the Stewart Hall Art Gallery for the vernissage of Art that Inhabits Us, an exhibition celebrating the 50th anniversary of the Art Rental and Sales Service. There are works by 150 artists (including one of my oils) and it’s sure to be a spectacular show. Hope to see you there! A few months ago I wrote about how I was hoping to motivate my first-year students to draw every week in a sketchbook as part of our Adobe Illustrator class together. In the past, despite my optimism, as the semester goes on I find that students draw less and less. This year, I am more than pleasantly surprised. I have never had such a keen bunch of artists. On Mondays they are proud to show me their drawings and they are improving every week. Today I took them on an outing to one of my favourite places to draw — McGill’s Redpath Museum. We spent the day sketching the dinosaurs, the taxidermy animals and even a bit of architecture. I have to say that it was one of the best days in my teaching career. First of all, at least half of the first-year cohort turned up for the optional event (this was a day off for them) and they stayed all day! And for a group who (for the most part) were never sketchers before they started this class, they did some truly incredible work (see the montage below). They made me proud to be their teacher. Whenever I clean up my studio I find unopened sketchbooks — usually carted home from a symposium and stored in a drawer — that result in me setting aside my cleaning to starting a sketch. As you know, there’s nothing more inviting than a pristine book of white paper, especially one you’ve never tried before. I think I brought this particular one home from Manchester last year. It’s a Seawhite Eco Sketchbook with a Kraft paper cover. Many watercolorists have suggested that I try Seawhite watercolour books, but this is not the same stock as that. From the Seawhite website, this particular sketchbook is described as ecological cartridge paper — probably better for pencil or ink work. But I thought I’d give it a try with some light washes to test it out. It breaks the routine to work on different grades of paper than what you’re used to. For this sketch, I started with the very dark areas, using more pigment than water on the brush — and then moved to wetter, more transparent areas. I like the opaqueness of the paint on the paper and the way I could build up several layers, especially with the bright colours. It almost felt like I was working with gouache. In fact, I may try that next time to see what it’s like. If you’ve ever tried this paper, I’d love to hear how you use it. I visit the same park every day with my dog, and every day I think, “I’ve gotta come back here to sketch the trees.” Well, we are having a long run of unusually great autumn days, so today I went back to the park, without the dog. I wanted to capture the great wall of trees before the leaves come down (that may happen tomorrow when it rains) and I couldn’t believe that it’s still possible to sit outside with no gloves on at the end of October! It’s always hard painting trees in the fall. It’s near impossible to capture the electric oranges without having the colours look too garish, so I just try to suggest yellows and reds and soft greens, hoping to convey an impression of autumn. 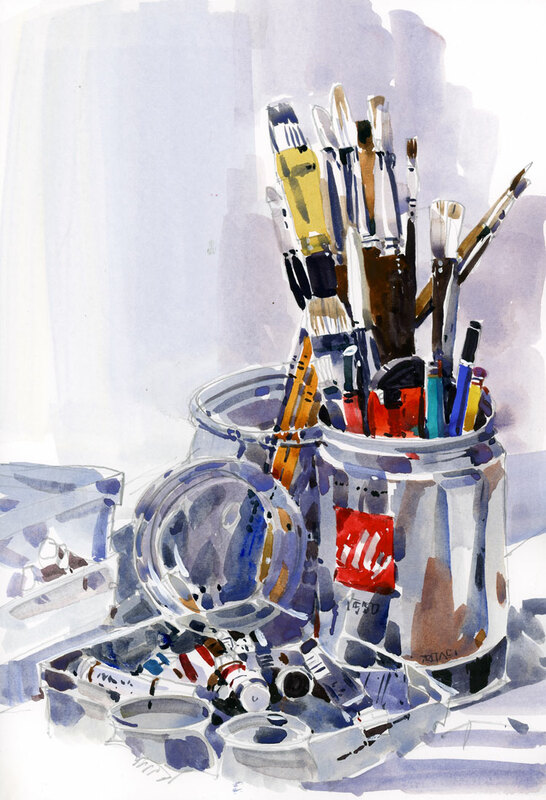 Sketched in a Handbook Watercolour Journal, 16″ x 8″. I was once again a spectator at a marathon in St. Jerome, and since there was a fair bit of waiting around, I brought along my sketchbook. I’m never sure if there will be a place to sit at these events so I travel light. With a water-soluble brush pen and a Koi water brush in hand, I sketched the fellow spectators at the run. I love the flexibility of drawing with a brush pen and how the dark line melts away with the lightest touch of water. It’s a perfect way to capture both line and tone in the most economical of ways. The big yellow crane has arrived at the Pointe Claire Yacht club, and that means the sailboats come out of the water for the season tomorrow. I thought I’d spend an hour or so drawing them before they disappear. It’s a warm and fairly calm day, and as I painted I witnessed one boat after another go out for one last perfect sail on the lake. Can’t say I blame them. Sketched in a Handbook Journal, 8″ x 8″.